Expedia's Ciputat vacation packages will help you save money! Bundling your reservations will give you more cash to splurge for your incredible trip. Book now on Expedia and earn savings of up to C$590*! It really is that simple! Our comprehensive database features more than 400 partner airlines and 321,000 worldwide properties. With such a broad range to pick from, you can't go wrong! Not 100% sure about your booking? There are no hidden fees from us if you make changes to almost any reservation. About to jet off on your Ciputat vacation? Don't know what sorts of things to add to your travel schedule? Don't fret — we're here to give you a few suggestions. We hope you remembered your swimming costume! No matter if you’re into stomach-flipping water slides, cruising down lazy rivers or splashing in paddling pools, Ocean Park is an unforgettable day out for the whole family. Adventurers are spoilt for choice in and around this destination. Just wild about animals? You can grunt, squeak and squawk to some of the most fabulous of them at Ragunan Zoo. It's a fun day out for kids and adults alike! Still got some time to spare? If you and your travel buddies are looking for a place to get together and regroup, Senayan City Mall is an ideal option. Chat over a coffee and peruse the stores for that perfect keepsake. Explore Ciputat with ease knowing that you've got accommodations secured. With at least 104 properties to select from, booking a cozy bed for your luxury getaway or cheap vacation will be a breeze! Valet parking, king-size beds and high-quality furnishings are just a few of the things you can enjoy at The Dharmawangsa Jakarta (Jl Brawijaya Raya No 26) and The Ritz-Carlton Jakarta, Pacific Place (Jalan Jendral Sudirman Kav 52-53). Book now for a taste of the high life! If you don't really like shelling out such big bucks, why not base yourself somewhere more affordable? 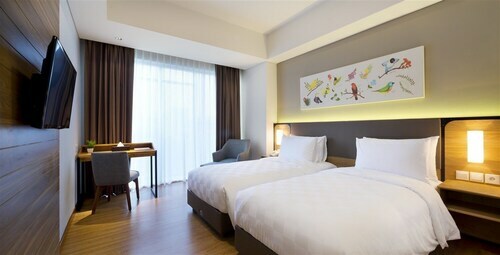 Have a look at the Marriott Executive Apartments Mayflower (Jl. Jenderal Sudirman Kav. 76-78) or the POP! Hotel Kemang Jakarta (JL. Kemang Raya No. 3). Soekarno-Hatta International Airport (CGK) is the starting point for most visitors going on a trip to Ciputat. It's based 13 miles (21 km) from the center of town. The friendliness of the staff makes you feel at home. The service is excellent. 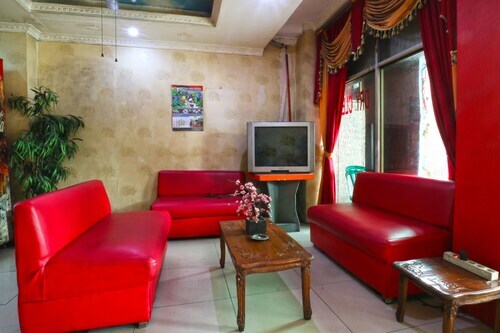 Situated in South Tangerang, this guesthouse is 3 mi (4.9 km) from Pondok Indah Mall and within 6 mi (10 km) of Block M Square and Gandaria City Mall. Pondok Indah Golf and Country Club and Cilandak Town Square are also within 6 mi (10 km). Pondok Betung Station is 26 minutes by foot and Pondok Ranji Station is 28 minutes. poor properties and facilities, toilet was broken. i don’t wanna to go to this hotel ever again..
very noisy locals without regard for others. wifi bad. 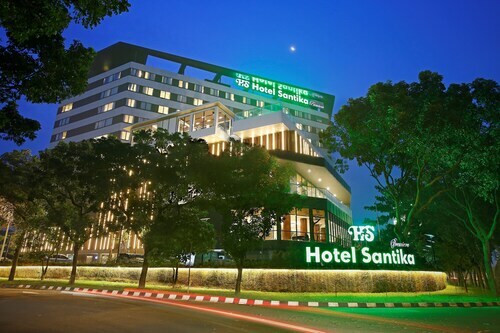 Situated in South Tangerang, this guesthouse is within 9 mi (15 km) of Situ Gintung, Gandaria City Mall, and Eka Hospital. TerasKota and Living World are also within 9 mi (15 km). Pondok Jurangmangu Station is 23 minutes by foot. 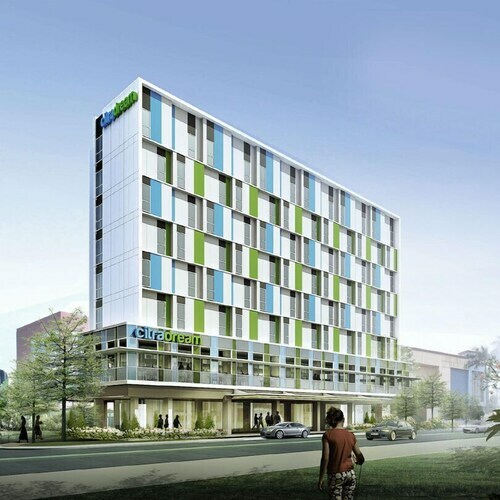 Situated in South Tangerang, this apartment building is within 9 mi (15 km) of Pondok Indah Mall, Block M Square, and Gelora Bung Karno Stadium. Kidzania and Grand Indonesia are also within 12 mi (20 km). Pondok Ranji Station is 11 minutes by foot and Pondok Betung Station is 17 minutes. Sat., 18 May - Sat., 15 Jun.